This post makes Man v. Food location number eleven! Big Pie in the Sky was CROWDED. We got lucky when we walked in and snagged an empty table (it’s a seat yourself kind of place). If you look, you can see an empty table with a hoodie on the back of a chair in this photo. That’s me “marking our territory” while ordering the food because the line was, quite literally, out the door. Now, before we go on, I should state that plans have been made to return to this place in one of my upcoming trips to Atlanta (I have two more planned in March.) This is because Joey Snackpants wasn’t doing so hot in the stomach department and NEITHER of us wanted to see him do what Adam Richman’s parter did in the challenge. …and yes, each slice IS as large as a small baby. 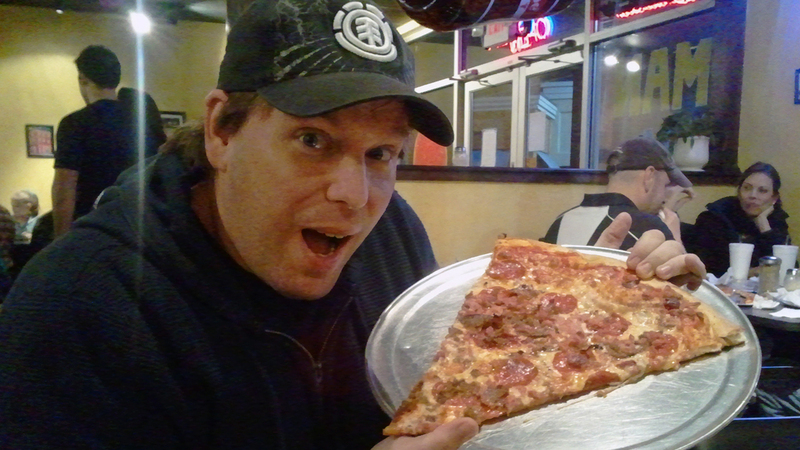 Now for the important stuff: it’s not just a gimmick… it’s really good pizza! Big Pie in the Sky doesn’t just toss something together for show; the pizza was truly good New York style pizza. The only difference I could see between this pie and one I’d get in NYC is the fact that you need to cut a few inches off and eat it with a fork before you reach safe “fold and eat” size. Joey and I were both pleased with how good the food was. If all goes well, I will attempt the actual challenge sometime next month. For now, though, I am satisfied with the fact that I had some really good pizza… something that is becoming a rare species in the land of Huts and Dominoes. Many toppings does it have ?